Signup for Cub Scout Summer Camp! Cub Scout Summer Camp is a two night sleepaway adventure that's the highlight of a Cub Scout’s year. Each day is packed with fun and excitement from sunup to sundown. Year after year, this is the program the boys really look forward to. 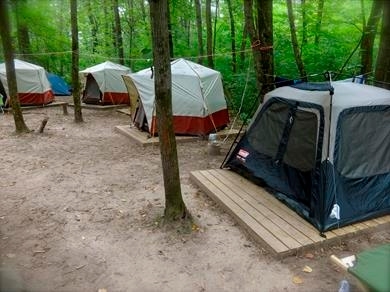 This camp is perfect for beginners and isn't as rustic as you think. No experience or gear necessary. There's no need to "rough-it" unless you want to. Choose a mattressed bunk in the cabin or dormitory that's also near flush toilets and hot showers. Traditional-style tent camping is also available. Outdoor Skills like knot tying, fire building, and whittling. Pack 151's boys (shown here) have a great time at summer camp. Scouts build lasting friendships, learn skills and experience the outdoors in a way that's designed just for them. We recommend that current Lions sign up for Tiger Den Days. 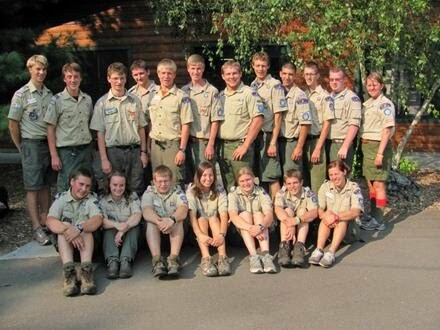 Current Webelos should sign up for Arrow or Light Navajo Camp at Tomahawk Scout Reservation. We want your stay to be comfortable and enjoyable. For that reason Kiwanis provides some of the best facilities and equipment you’ll find anywhere. Choose accommodations that are right for you. Buildings-Dormitory: This is a “bunkhouse” style building, centrally located near the dining hall, showers and flush toilets. Features beds with mattresses. Buildings-Cabins: Sleep on mattressed beds/cots with a roof over your head. Tents: Two-person modern nylon tents pitched on raised wooden platforms with integrated bug screens. Sleeping pads/cots are provided. Note: By the time your son attends Cub Scout Summer Camp in late July, he'll be considered a rank higher than he is now. The Northern Star Council does all the planning for you. Parents who come to camp with their Cub Scout are expected to have as much fun as the Scouts! Almost all activities at Cub Scout Summer Camp are designed for the adults to do alongside the Scouts in their group. Cub Resident Camp's Webelos Outpost is an extra, optional opportunity for Webelos I Scouts attending Cub Scout Resident Camp. It's a chance for these Scouts to travel to a more remote part of camp, set up tents and cook their own food while learning some more advanced skills. This opportunity is definitely worth the extra time and cost! 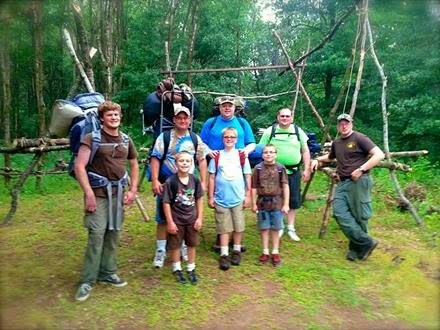 Webelos will enjoy the extra challenge, and younger Scouts will look forward to the outpost in future years. Webelos Outpost fee is an additional $35/person. Webelos Outpost begins on Sunday, July 31. and ends Monday, Aug. 1. RSVP "yes" via Scoutbook no later than 2/18 - Leave a comment telling us which overnight option you prefer, Tent or Building. - Bear families please indicate whether or not you'd like to signup for Webelos Outpost. - To RSVP: log into Scoutbook > click My Dashboard > click Events > click Upcoming Events > click on the CAMP: Cub Scout Summer Camp event on July 29, 2016 > click the "? ", change your RSVP to "yes". - Pack 151 will withdraw a nonrefundable $15/person deposit from your Individual Scout Account (ISA). - ISA balances are published to your Scoutbook account. - Check your ISA Balance: log into Scoutbook > click My Dashboard > under My Family, click your son's name > scroll down and click on his Payment Log. - If you have an insufficient ISA balance for the $15/person deposit, you'll need to provide a nonrefundable deposit check (payable to Pack 151) to the Cubmaster by 2/18. - Families applying for Camperships should do so ASAP. Contact Cubmaster for details. - Northern Star Council's Summer Camp reservation system opens 3/1/16 at midnight. - The best camps/dates/options (the ones we prefer) fill within hours (sometimes minutes) of opening. - Pack 151 will submit your name, housing preference and $15/person deposit. On March 17, at our pack meeting, you'll receive a printed paper "Parent Portal" card. - The Parent Portal is the NSC's online too that enables you to provide detailed contact info, diet restrictions, allergy info, and make final online payments in April. - submit a second payment on your behalf using your ISA funds, which we;ll apply to your reservation. - notify you of any remaining balance you owe to the NSC. April 2 through April 31 - You must pay the remaining balance online via the Parent Portal. - Full payment is due. - If your reservation isn't paid in full by 5/1/16, the NSC may cancel your reservation. All deposits and subsequent payments may be forfeited. Unless you notify us* otherwise, Pack 151 assumes that you'll want to use as much of your ISA funds as possible to pay for combined (adult plus Scout) Cub Scout Summer Camp Scout fees. Some families, however, may want to use ISA's to subsidize the cost of multiple events throughout the year. Or families with Cub Scout siblings may wish to move funds between sibling ISA's. These and other options are allowed- please contact us* before April 1 to discuss. New reservation requests* received after March 1 are subject to availability. New reservation requests* made May 1 or after require full payment at the time the reservation is made. Subject to availability, new reservations* may be made up to a few days prior to the campout. If camp session is full, youth/adults may be added to a waitlist. We'll let you know if this happens*. - Cancellation requests received* March 31 or before result in deposit forfeiture. - Cancellation requests received* April 1 and after may result in deposit forfeiture plus forfeiture of additional funds paid (including ISA payments Pack 151 made on your behalf and any payments you made) unless you're able to arrange a swap. - Swap: Before July 15, it may be a possible to swap your reservations with another pack family that agrees to take your reservations. Any swap must be approved by Pack 151* and the NSC. - No-Shows receive no refunds. Full refunds may be granted in the event of family medical emergencies or other such extreme circumstances. Requests must be made in writing, addressed to the Northern Star Council Director of Camping, and sent to goscouting@nsbsa.org for review. Any refunds will be issued to the pack for distribution. Email outings.pack151@gmail.com regarding registration questions, cancellation requests, late registrations, etc. What if the pack's selected dates doesn't work for me? There are many backup dates and locations available. Email me for options. Individual Scout Accounts may be used for alternate dates too. For each person in your family attending, (adults too) copies of each of the following forms must be turned in at camp. Use the links below to download and print the necessary forms.